writer (1803-1882). 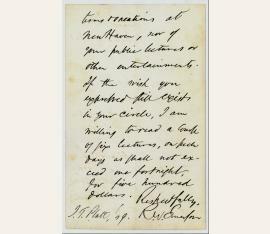 Autograph letter signed ("R. W. Emerson"). Concord. One page both sides. 8vo. 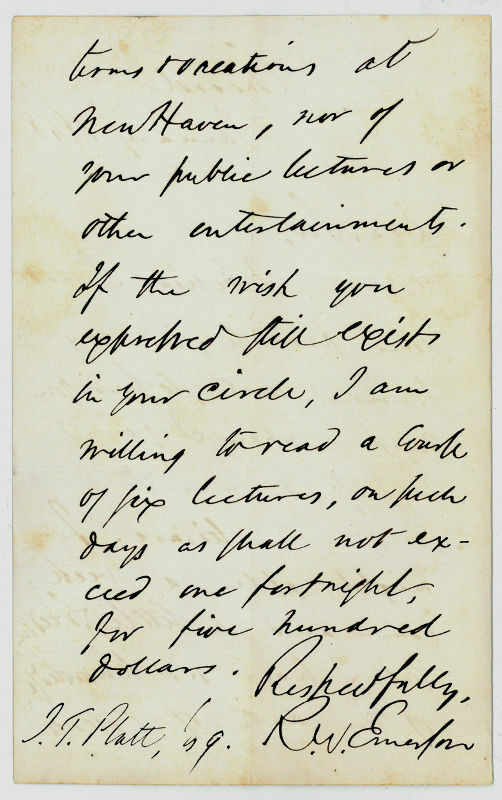 Letter to Professor Johnson T. Platt, in full: "I believe I made some promise, in my former note, to send you word when I found myself at home & in comparative leisure. I might, after a week, command a little freedom, but I have no knowledge of the date of college terms & vacations at New Haven, nor of your public lectures or other entertainments. If the wish you expressed still exists in your circle, I am willing to read a work of six lectures, on such days as shall not exceed one fortnight, for five hundred dollars [...]". - In fine condition, with intersecting folds and slight foxing.